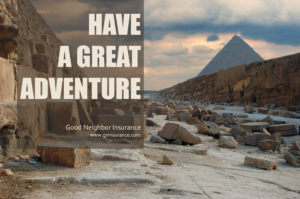 Roundtrip Choice international trip insurance is an excellent plan for protection while on short trips less than 90 days. It provides international health insurance as well a trip cancellation insurance to protect you medically and financially. This is a great affordable insurance option for people on business work abroad, taking an international cruise, doing volunteer work and for short term missionaries. It is also a popular option for U.S. citizens who are traveling in the U.S. and Canada. Since it provides travel health insurance, sometimes those on Medicaid or state insurance don’t have coverage outside their state of residence, so they can secure this for short trip insurance. Eligibility: To be eligible for this health and international travel insurance, you must be located inside the United States at the time of your application. This is actually the only trip cancellation plan we have that will provide coverage where you are located, including in the U.S.! Benefits and coverage: The maximum length of time you can be covered is 90 days. For you who are age 81 and older, you may not secure coverage for more than 30 days. The premiums are on a 30 day basis, and additional daily premium is added for each additional day of coverage. The premium will also increase according to the amount of your insured trip costs. You can also secure this plan without insuring any trip costs, which still provides you with travel and medical benefits. Let’s go a little more in detail about the great international travel insurance benefits! International trip insurance benefits: You can insure your non-refundable trip costs up to a maximum of $50,000. The rates for each trip cost category are located inside the brochure and quotes are available online. There is trip cancellation and trip interruption coverage. Cancellation refers to a trip being cancelled before it started; interruption refers to a trip that has been cancelled/interrupted during the trip. The reimbursement for cancellation is 100 percent, and the reimbursement for interruption is up to 150 percent. There are reasons that the insurance company will reimburse you for your non-refundable insured trip costs, which are the same for both trip cancellation and trip interruption. One of the covered reasons is your sickness, injury, or death. Some of the other benefits are trip delay, missed cruise connection, lost baggage/personal effects, and baggage delay. Medical benefits: Medical expenses for new injuries and new illnesses are covered to $150,000. International medical evacuation insurance is provided to $1,000,000. Accidental death and dismemberment coverage are also provided. This plan does not cover pre-existing conditions. It is designed to protect your health if emergencies happen. Protection is one of the reasons why medical evacuation is so important. When you travel, we always recommend including medical evacuation to your travel health insurance for your protection. Medical evacuations will take you from one place that cannot treat you, to the nearest place for your required medical care. All evacuations must be done by and through the insurance company, so it is important for you or someone with you to contact the insurance company in this event. They actually coordinate and pay for the evacuation coverage. Additional coverage to add: There are also additional coverage options you can add to this coverage. Flight accident, collision damage waiver (CDW), and cancel for any reason! Cancel for any reason allows you to cancel your trip for anything, as long as you cancel within two days from your schedule departure date. This is available if you purchase your policy within ten days of the initial trip deposit or payment, and if you insure all prepaid costs which are talked about in the certificate. The collision damage waiver is for rental cars. This is one of the popular international travel health insurance plans that people choose for their trip cancellation coverage. It is affordable insurance and we hope this helps you have an idea of what it can provide for you! This is a great trip cancellation insurance plan for people mostly traveling on vacations and cruises, but also for volunteer opportunities and working overseas at NGO jobs. nonprofit jobs, and international business. Perhaps this is a good fit for you!